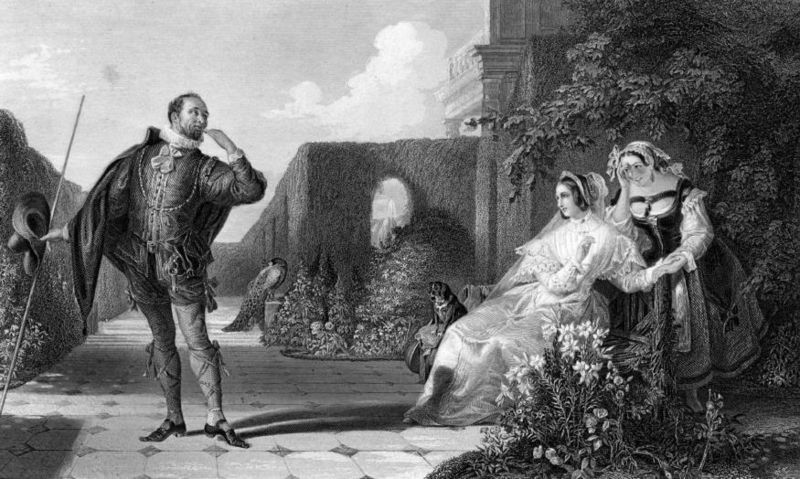 Twelfth Night, comedy by William Shakespeare, which was probably written around 1600. 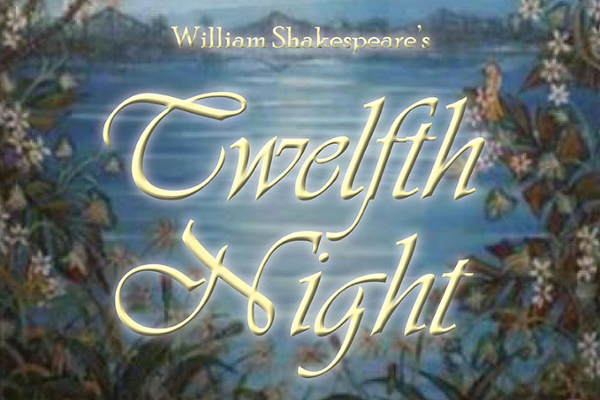 As an example of a play written during Shakespeare's second period, which included his English history plays and so-called joyous comedies, Twelfth Night presents a happy balance of plot, characterization, and diction. The main plot is derived from an Italian novella and deals with the hapless love of Viola, disguised as a page, for her master, who at once falls in love with her. When Viola's twin brother Sebastian appears, Olivia mistakes him for the page and marries him. The tangled situation is cleared up when brother and sister meet and recognize each other; the Duke rewards Viola's devotion by his offer of marriage, and all ends happily. This romantic story is set against a background of daily life in Olivia's household, crowded with realistic figures: Olivia's conceited steward, Malvolio; into believing that Olivia loves him, and his absurd behavior results in his temporary confinement as a madman. Feste, a singing fool, wanders back and forth between the households of Olivia and the Duke, observing the comical confusion with a cynical eye. Twelfth Night begins with music and ends with a song. In Twelfth Night each individual is locked in his own private understanding and his ability to escape from himself and share experiences with others is limited. The sense of community is weaker than in Midsummer Night's Dream & As you Like It. We are aware of each character as an individual, out on his own, the lovers trying to make contact, but with limited success, and the comic figures either openly hostile or forming relationships based on temporary expediency. The solitude of the lovers results from their experience of unrequited love, an experience that leaves them frustrated and restless. Throughout Shakespeare, the sea suggests both destruction and new life; in Orsino's mind, however, the ideas are held not in balance but in confusion. The foibles of the characters are shown through the way they misuse words, and are trapped by words. Orsino turns everything into verbal fantasies, to feed his desire for sensation. For Orsino, all activities (including love) are swallowed up by the language that expresses them, and the result is a life of words alone, with no hope of action. Malvolio also creates a fantasy world, and bends language to this purpose. When convinced of Olivia's love, he takes even "fellow" as a term of endearment. Feste and Viola, who both depend on words-one as a professional wit, the other as a messenger of love-see the dangers of the medium on which they rely. For all these characters, language is not a means of escaping from the private self, and making contact with others; it is rather a means of defining the self and confirming its privateness-one more barrier erected against the reality of the world outside. When Viola is sent to Olivia by Orsino to tell his love and adoration, she asks her "how does he love me?" the last question suggests, for all her joking about the conventional language of love, Olivia has become fascinated by Viola's eloquence and wants to hear more. The comic figures operates in quite a different way, and their scenes are dramatically simpler. There is no subtext, for there are no hidden depths of feeling: the self-indulgence, pretension and the mutual hostility are out in the open. In addition, while the lovers struggle with misunderstandings, they have not created and cannot solve themselves, the misunderstandings of the comic plot, centered on Malvolio, are deliberately manufactured by Maria and her cohorts. The barriers that separate people are actually fortified and the hostility bet. Malvolio and the rest of the household has a sharpness unusual among shakes comic figures. However, the final crucial difference between the two plots lies in the manner of their respective endings. The deception of the love plot are partly the result of chance, and chance can take a hand in resolving them. But the deceptions of the comic plot are manmade, the result of fixed, antagonistic, personalities. And there is no easy or satisfying solution for this plot. After our initial amusement, we become aware of the inherent cruelty of the jokes against Malvolio. When Malvolio is shut in a dark room, begging for light, we see the victim's sufferings a little too clearly, and our laughter acquires an edge of distaste. The jokers reaction when their victim is down is to hit him again. Malvolio in his dark room is the play's most vivid image of the trapped, isolated self. Egotism and loveless solitude are a kind of damnation, and the imprisoned Malvolio is our clearest image of this. The two characters are mirror opposites. Malvolio, assured of Olivia's love, is the victim of a conventional comic deception in which his senses betray him; Sebastian, actually presented with Olivia's love, wonders if it is a fantastic illusion. Malvolio insists, vainly, that he is not mad. Sebastian thinks too, but with greater hesitation wondering whether to trust his senses or not. The comic plot: is conventionally full of false images: Maria's letter, Feste's disguise, Sir Toby's description of Sir Andrew as a dangerous swordsman. Thus, when Malvolio adopts the external shows of love, in yellow stockings, cross-gartered and relentlessly smiling, the result is simply absurd. The romantic plot: operates by a different set of rules. Throughout the romantic plot, a trust in appearances, though it may lead to temporary confusion, is justified in the long run. To Orsino, Cesario looks like a woman; he is a woman. To Olivia, he looks like a man; he is a man. This trust in images is made possible by the special handling of the figure of Cesario, in which the extension of personality implied in disguise is taken further, and exploited in a more daring way, than in any previous comedy of Shakespeare's. Clifford Leech describes the ending as "and exposure of the triviality of human desire." Philip Edwards concludes that the union of the lovers is treated sardonically, Shakespeare having become tired of such endings. Sebastian, the agent of release for the lovers, has given the knight nothing but a sound beating. Sir Toby's false friendship for Sir Andrew has collapsed. 'Well, Jove, not I, is the doer of this, and he is to be thanked. To Feste's "thus the whirligig of time brings in his revenges," Malvolio replies I'll be revenged on the whole pack of you." This kind of tension is basic to Shakespearian comedy: it is at bottom a tension between stylized and realistic art. The lovers, having engaged our feelings as human beings, are now fixed in a harmony we can believe in only by trusting the power of fantasy; the clowns, stylized in their own way at first, have lost some of the immunity of comedy and now present an image of defeat that is uncomfortably real. In Twelfth Night the triumph of love is put at a distance as a strange and special miracle that cannot touch everyone, but the vision of decay that opposes it is also, in the last analysis, one more illusion, part of a play. The one thing that is permanent is the work of art itself.